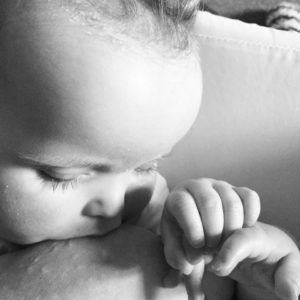 You are here: Home / Breastfeeding information / Is My Baby Getting Enough Milk? How do you tell if your baby is getting enough milk? In a world where everything is measured, it can be nerve-wracking when you can’t see how much milk your breasts are making. How frequently are you breastfeeding? Some parenting books recommend routines for breastfed babies. But routines can reduce breastmilk production, as can unnecessary supplements or a dummy. Whatever his weight, a young baby needs to nurse at least 2–3 hourly to establish his mother’s milk supply and get enough milk. Frequent nursing is normal, partly because breastmilk is a drink as well as a food. Adults rarely go longer than a couple of hours without a drink, snack or meal. Your baby’s tummy is tiny and breastmilk is quickly digested so he needs frequent feeds to help him grow. Newborns often lose up to 7% of their birth weight in the first few days. Once your milk production increases, usually on day 3–4, expect your baby to begin regaining his lost weight. Most babies regain their birth weight by 10–14 days old. Your baby will grow at his own rate, and a growth chart will indicate how he is doing (see Further Reading). Once breastfeeding is going well and there are no concerns, weighing is advisable no more than once a month in the first six months. If there are concerns, monitor the trend of his weight change over several weeks rather than focusing on one particular week. Your baby’s weight may increase steadily and so follow a single percentile line on the chart, or rise faster, crossing the percentile lines. A gradual drop from one percentile line to the next (or the equivalent distance) is unlikely to be a problem unless his weight is low for his age. Heavier newborns often show ‘catch-down’ growth—meaning they gain weight steadily even though they gradually drop against the percentile lines. Dropping against the chart is more of a worry for lower weight babies. Seek help quickly if your baby isn’t gaining weight well. See our page My Baby Needs More Milk, or contact an LLL Leader for further information. You may instinctively know how your baby is doing. Ask yourself: Does he have good colour? Is he nursing vigorously? Is his skin firm? Does he look healthy and seem active and alert? Is he meeting developmental milestones? Dirty nappies are a good indicator of how much milk your baby has taken. The table below shows what is normal. The more often you breastfeed, the more milk you will produce. You will make less milk if you breastfeed less often. In the early weeks, a baby needs to nurse about every 2–3 hours, or at least 8–12 times in a 24-hour period, including some feeds at night. Allow your baby to breastfeed for as long and as often as he seems interested. To help him get a balanced meal let him finish feeding from the first breast before offering the second. A baby who sleeps a lot rather than feeding every 2–3 hours may need to be wakened to nurse, and this is particularly important if he has jaundice or isn’t gaining enough weight. If this is difficult, or he is lethargic, ask your midwife, health visitor or GP to check that all is well. Our page Sleepy Baby – why and what to do explains more. Most mothers can produce enough milk to meet their babies’ needs. Breastfeed often, offering both breasts—at least 10 times in 24 hours. Wake your baby if necessary. Watch for rooting (head turning) or fist sucking—crying is a late sign of hunger. Encourage ‘cluster nursing’—breastfeed very often at times when your baby is willing to. Check your baby is latched on well. Position him ‘tummy to mummy’, with his whole body close against yours. Make sure he has a large mouthful of breast. Listen for swallowing as he feeds. Keep your baby close—try Biological Nurturing™, reclining comfortably with your baby while lightly dressed or in skin-to-skin contact close to your breasts. Give him lots of opportunity to breastfeed, even in a light sleep, and this boosts levels of the hormones that increase your milk. Encourage breastfeeding for comfort as well as food as this boosts milk production. Stop using any dummy—breastfeed instead. Night feeds are especially important for establishing and increasing milk production. See our page Safe Sleep & The Breastfed Baby. Get help with household jobs—ignore the dust and eat simple, easily prepared meals so you can concentrate on resting and breastfeeding your baby. The most effective way to increase your milk production is to take your baby to bed with you for a day or two, and focus solely on nursing and caring for him, whilst other people take care of you. Support your breast with one hand—thumb on one side, fingers on the other. Wait while your baby breastfeeds actively, his jaw moving all the way to his ear. When he stops swallowing, compress your breast firmly to increase milk flow. Hold it squeezed while he continues swallowing, then release your hand. Rotate your hand around the breast and repeat step 2 on different areas of the breast. Go gently—this should not hurt. Try switching breasts at least two or three times during each feed—when he comes off the first breast on his own or when breast compression no longer keepshim breastfeeding actively. As time goes by you’ll find that you no longer need to do this. Removing small amounts of milk even from soft comfortable breasts increases milk production: Full breasts slow milk production—you may need to nurse more often. Babies nurse for comfort as well as for food: Those little ‘in between’ comfort feeds really help your milk production. Your baby is fussy: Many babies have a regular fussy time (often evenings) however hungry or not they may be. Some babies need lots of stimulation; others need soothing. You’ll soon learn what your baby needs. If he settles at the breast, just let him nurse. Expect your baby to want to breastfeed very often from time to time: Your breasts will quickly adjust to making more milk if you follow your baby’s needs. Your baby’s feeds become shorter: Perhaps only five minutes at each breast. Most babies become very efficient at breastfeeding once nursing is going well. Babies’ feeding patterns are very individual: If your baby is gaining weight at an appropriate rate, then following the feeding pattern he chooses is the best way to meet his needs. Your milk is always perfect for your baby, even if he is gaining weight slowly. A breastfeeding solution is usually possible if he needs more milk. Call our Helpline to speak to an LLL Leader. Mothers in your local La Leche League Group can offer support and encouragement. Written by Sue Upstone and mothers of LLLGB. Photos courtesy of Liz H, Ellen Mateer and Kimberly Seals Allers. My Child Won’t Eat, Carlos González, C. London: Pinter & Martin, 2012. This information is available to buy in A4 printed form from our shop.